What Is Your Current Automotive Curiosity? One of the great things about the automotive world is the fact there is no shortage of different kind of cars to learn about. With this in mind we want to know what car previously unexplored car you are currently the most intrigued by. They might be out of your price range, you might not even have any real desire to own one or you might in the midst of developing a bad case of needing to own one, but what unfamiliar automobile have you been most interested in recently? What is your current automotive curiosity? 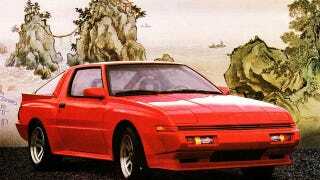 My current automotive curiosity is the wide body Mitsubishi Starion/Chrysler Conquest TSi . I've always been fond of the ridiculously 80s looks, but a recent desire to learn more about turbo 4 cylinders has me thinking of one of these for the perfect platform for a turbo 4G63 build. I couldn't know less about anything DSM or four cylinder so I doubt my wide body dreams will ever become a reality. Even so the prospect has made for plenty of entertaining car searching and forum reading while trying satisfy my Station/Conquest curiosity.